An article in Smithsonian magazine recently caught my eye. Titled This Tower Pulls Drinking Water Out of Thin Air by Tuan C. Nguyen, it showed massive drop-shaped weaved baskets in Africa (the same photo as above). "Although there have been some local successes in improving water quality (mainly in developed countries), there are no data to suggest an overall improvement in water quality at the global scale." There is also compelling evidence that groundwater abstraction is increasing every year by 1 - 2 percent worldwide. Digging deep into the ground for water is no longer a viable solution (not to mention the costs of parts and electricity required to maintain groundwater pumps). So any invention that can collect condensation that requires no electricity, no heavy machinery, no imported or complex parts certainly has garnered the attention of environmentalists everywhere. The invention is called the WarkaWater and the company that created it is Architecture and Vision. Up next is a short (1:49 sec) video published on April 7th, 2014 by Today Breaking News that shows the Warka up close. You can even see how the mesh captures condensation. 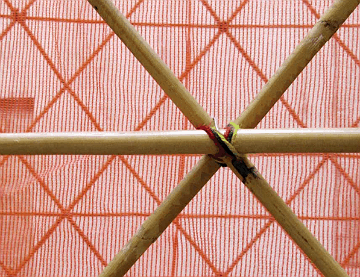 Architecture and Design / Used with PermissionThe outer semi-rigid lattice is made of bamboo or locally available giunco (aka juncus) stalks, wire, and rope. The inner nylon/polypropylene mesh, that resembles a deflated geometric balloon, collects water droplets from the air through condensation - a process helped by large fluctuations in temperature. When night turns into dawn is when most of the condensation forms. Dew drops are collected and gravity funnels them into a receptacle at the bottom. As simple as it sounds, creating such a structure on a large scale that is effective required two years of design and five prototypes. The canopy around the widest part (shown at the 41 second point in the video Architecture and Vision / Used with Permission above) has since been removed. The Warka has proven to be a superior condensation-based invention. Field studies revealed that it can collect over 25 gallons of water in a day. Not only that, the Warka doesn't require deep drilling, electricity, or imported parts to maintain it. The materials cost $550 to build one - however with mass production, that number would drop even lower. Department for International Development / Licensed under Creative Commons Attribution 2.0 GenericRural villages in northern Ethiopia are where architect and designer Arturo Vittori was inspired to create the Warka. The Warka tree (aka Ficus vasta) is a declining species of fig tree native to Africa. 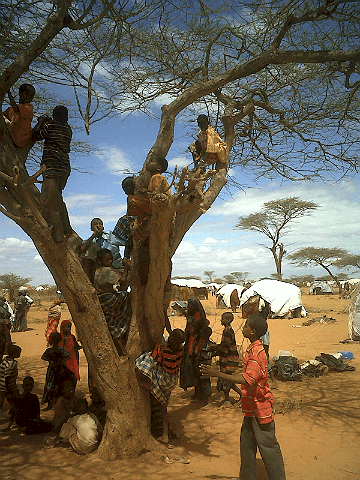 Traditionally this huge tree was a meeting place for villagers, a place for shade, and a place to learn. With their status in decline (they are a conservation dependent species), it seems appropriate that Vittori's ornate and vital structures grace the landscape. And wow, what a great place to have a water cooler chat. Even more endearing to me was that villagers will be constructing their own Warkas, so they are bound to be proud of their handmade creations that benefits the whole community. First, the Warka is made from sustainable resources found locally. There's no heavy machinery, specialized components, or technical maintenance required. The set up only requires 5 or 6 people and a few days of work. The Warka weighs about 80 kg (176 lbs.) so I'd imagine they can also be moved, if villagers need to change location. 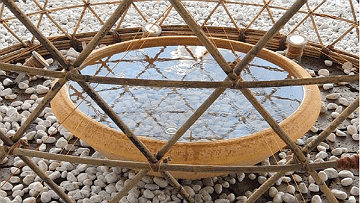 Second, the cost associated with the Warka is minimal compared to other water harvesting solutions. As more are produced, they will become even less expensive. Finally, the Warka is an empowering gift for people who struggle to find safe water everyday. Spending 6 hours a day searching for water is time better spent on learning and other social activities. Safe, potable water is a human right and essential for life. Architecture and Vision / Used with PermissionWhen I requested permission to use photographs of the Warka for this article, I was amazed that Arturo Vittori personally responded. 1) On a specifications list for Warka, I found the following: Energy: Solar panel for illumination (however I did not see or notice it in videos or discussed elsewhere). So I'm wondering, are there solar panels to light up the Warka? And if so, are they used to heat the air inside the mesh fabric (somehow) to promote condensation? 2) According to the CDC, Africa is the most affected by malaria. Since mosquitoes (specifically Anopheles gambiae) are responsible for this deadly disease, are there any concerns about "standing water" in the Warka becoming a breeding ground for mosquitoes? Has this already been addressed in the design of the Warka? Arturo Vittori: "You are absolutely right but this is an undisclosed element of the project." 3) I noticed on your website that there is a WarkaWater 2.0 coming out with improvements to its design. I was wondering if there is anything more you can tell me about it? has been adopted a different connection system between the junco roots and it is faster to assemble. Packaging and transportation have been optimised." You can find out more about the Warka Water tower by visiting Architecture and Vision or the WarkaWater web page. Author's note: I'd like to personally and publicly thank Mr. Arturo Vittori for taking the time to respond to all of my questions immediately and provide additional information about his incredible, life-saving water harvesting invention.